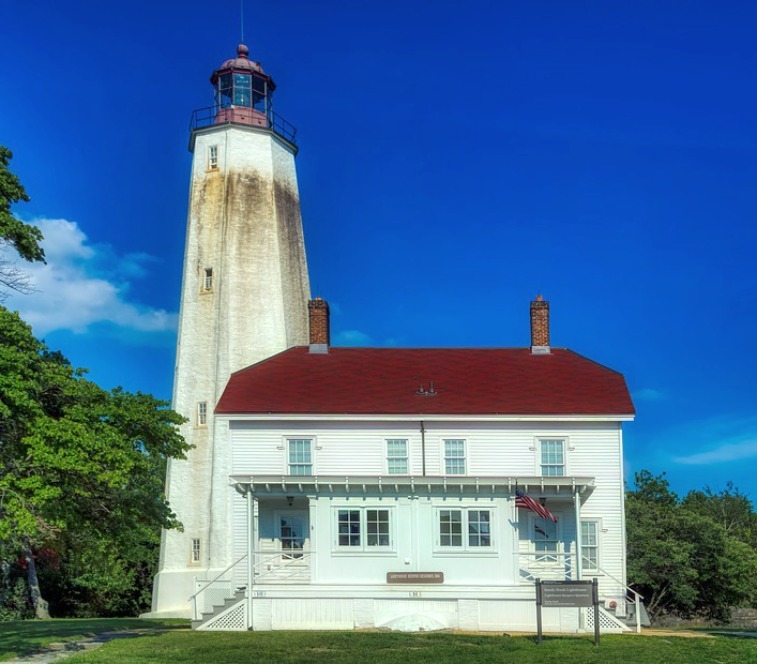 The historic Sandy Hook Lighthouse is located on the grounds of Fort Hancock in Sandy Hook, New Jersey. The lighthouse was built in 1764 by Issac Conro and is the oldest working lighthouse in the United States. This beautiful light was built to help guide mariners into the southern end of New York harbor. The lighthouse is done in an octagonal shape (eight sides) and stands 103 feet tall. The keeper's house is open daily from 10 AM to 4 PM. Tower tours are available from 1 PM to 3:30 PM and are limited on a first-come, first-serve basis. The grounds, house and tower are ONLY open during the in-season, April 1st through October 31st. The visitor's center is open every day, except major holidays. Please check their website before planning your visit for the most up-to-date information. * Children need to be accompanied by an adult. * Wear comfortable walking shoes, you'll be doing a lot of walking, especially if you plan on climbing the stairs to the top of the tower. * Dress appropriately for the season. The wind coming in off of the ocean can get really chilly during certain times of the year. * Bring plenty of bottle water and snacks. If you plan on spending the day outdoors bring along sunscreen. Adjacent to the lighthouse is Fort Hancock which operates a museum and history house. The Sandy Hook Bird Observatory is located at Fort Hancock and is operated by the New Jersey Audubon Society. There are beaches and other activities nearby. When visiting, I recommend that you spend the entire day exploring everything that the park has to offer.